When it comes to rainwater collection and storage, numerous options exist. From steel, to concrete, to plastic – all water tanks have their advantages and disadvantages. Not only do you have to think about the material when thinking of installing a new water tank, but additionally, whether the tank should be located underground or above ground. This can really make choosing what would be best for you quite a gruelling task. However, in Australia, since water harvesting has become a staple for every household, this is a decision you may not be able to avoid forever, and therefore, knowing a bit about tanks can go a long way in ensuring you pick an option that suits all your needs. In cities such as Sydney, the rise in population has resulted in residential areas becoming more and more crowded. Additionally, natural calamities such as droughts sometimes result in stringent water rationing measures that every resident must be prepared to deal with. This is why rainwater harvesting is so important. Over and above that, making use of collected rainwater for processes such as flushing toilets and watering plants can cut your municipal council water bills by up to 50% as well as reduce your environmental footprint. We believe that underground tanks may be the best option for you. So, as you embark on this path of water tanks, which is rife with options, we will have a deeper look as to why in-ground water tanks are worth your consideration, especially as a city dweller. In-ground water tanks are tanks that are located beneath the ground in your home. These tanks come in different forms including: concrete tanks, plastic tanks and bladder tanks. Rainwater is directed from your roof to the tank, and from there, piped into your home. While this water oftentimes may not be potable, it is usually clean enough for use in toilets and outdoor water uses, such as hosing the veranda and watering the garden. This is thanks to inbuilt contemporary sieves that strain the water and thus get rid of most of the particulate impurities before it reaches the tank. But what makes these tanks such a great option? The main advantage of underground water tanks is their economy of space. While installing tanks above the ground is usually easier and cheaper, on-ground tanks can really eat into space that would otherwise be left to serve other purposes. In-ground water tanks are the better option when it comes to rainwater harvesting in more densely populated areas, such as the city, where space is very limited. The tank can be installed beneath the house itself, driveway, or any other sizeable underground spaces, for that matter — as long as it is adequately supported. This can really open up your garden and backyard, and allow for you to make the best possible use of your outdoor spaces. Why have a tank where you could have a beautiful flower garden? Underground water tanks also tend to last longer than their on-ground counterparts. This is because they are mostly shielded away from the elements such as heat, rain, UV radiation and extreme cold. They are even virtually resistant to fires, which sometimes plague some parts of Australia. Installing your tank underground does not only keep the tank away from dangers, it also keeps pets and other animals away from it. 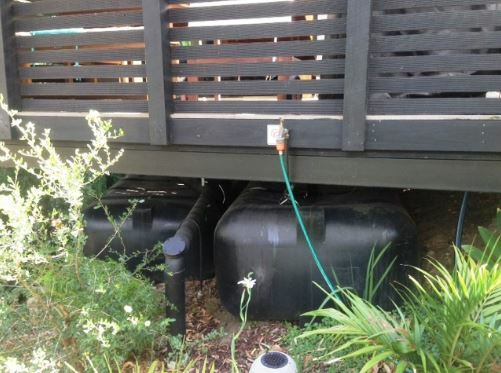 In-ground water tanks are found in a myriad of sizes, ranging from 3000 litres, all the way to 11000 litres. You can therefore be sure that these you will find a tank suited for your needs. Not only do sizes vary, but you can also install tanks in series, depending on how much underground space can be obtained on your property, and how much water storage you need. By using a tank size estimator, for example, the free, online Tankulator, you can get a fairly accurate estimate as to what size of tank would be best for you, based on your household water usage, location and water catchment potential. So, beyond the dread initial cost of installation of in-ground tanks, all the hustle of excavating and remodelling your landscape to accommodate the tank, in-ground tanks can really go a long way in saving you maintenance fees and other overhead costs. At the same time, your tank will help you save on your municipality’s water bills, as well as valuable space. These are just some of the reason that make this type of tanks such a popular option in Australia.